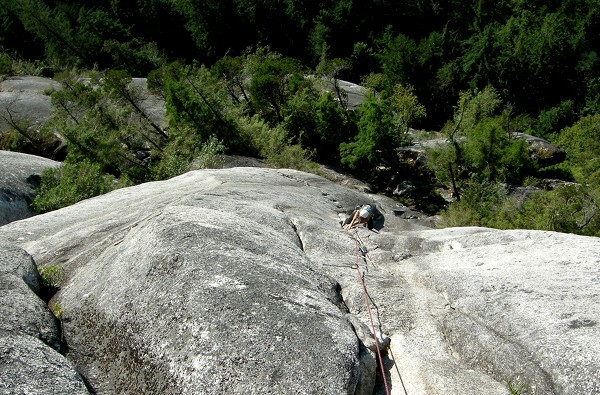 Recently, I had the chance to jump on some under-the-radar Squamish classics. Right Wing defeated me brutally a couple of years ago and I've been wanting to try it again. Both Right Wing and Liquid Gold are very sustained, demanding 5.10s, more so than other multipitch 5.10 Squishy routes I've climbed. Right Wing starts with a short bit of technical bolted stuff after 70 m of classic 5.8 cruising on Eagle's Nest. After that comes 60 m of nonstop mostly brutish 5.10. Naomi is about where I bailed two years ago in this one. 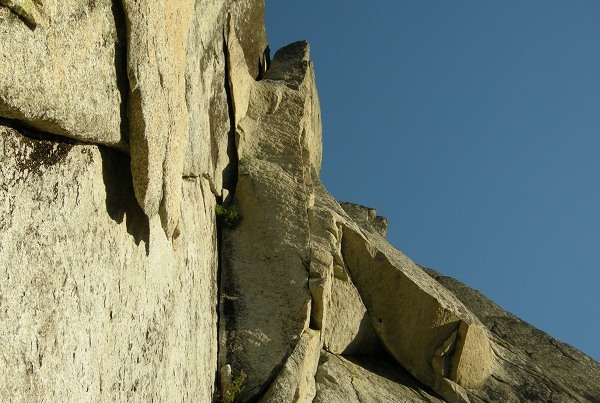 The finish on Right Wing climbs an overhanging wall via a corner and a wild protruding beak of rock (left of center near the top of the photo). This pitch is a wee bit like the Sail Flake but it's better, badder and burlier. Sweet jamming in the corner before the beak, too. Really it's probably nothing like the Sail Flake. I chose Right Wing so it was Naomi's turn and she chose Liquid Gold. 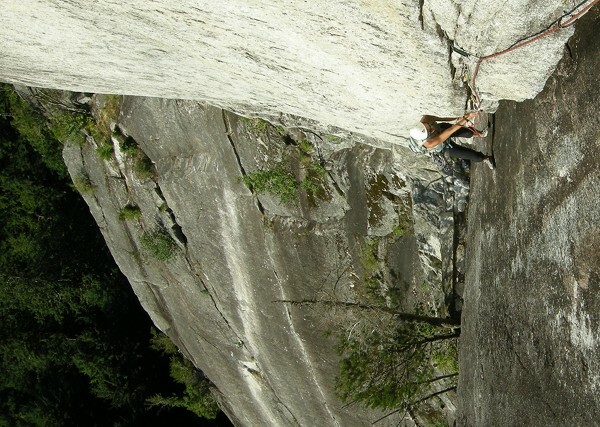 It starts with some tricky technical stuff and a hard slab move, then the next pitch is a thuggish corner. The slab move pwned me while seconding so I felt a little better after on-sighting the thuggery but it was funky and the overall vibe for me was still WTF!? Then Naomi became overwhelmingly stoked when her chance arrived to lead *a real chimney*. 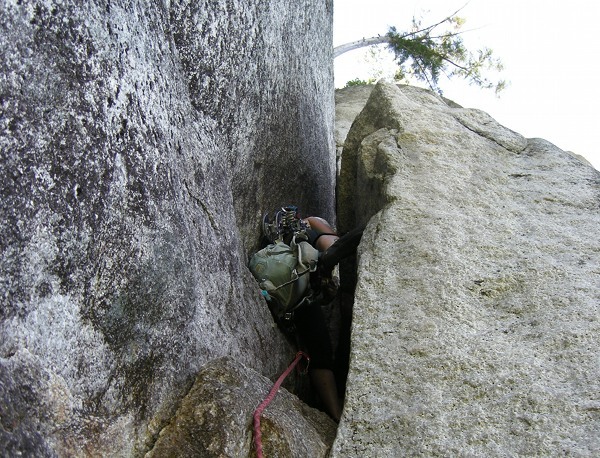 The climb ends with a serious money pitch. 60 m of hands, fingers, laybacks, stems and bulges. 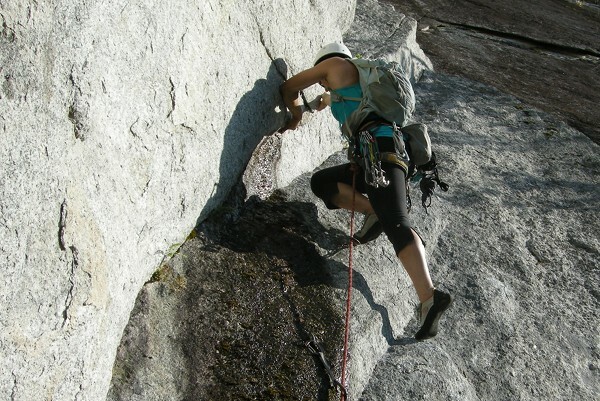 I was concerned about not having any gear left and I felt like I was melting in the hot sun, but this pitch left me STOKED. Those were two really good climbs and yes, I was super dooper excited to lead a chimney. I liked both the pitches I lead on Liquid Gold. Sky was el hombre on Right Wing. The strenuous laybacking on Right Wing. Sky just before the beak. The wall is already quite overhanging. Note: Sky's long legs + flexibility = advantage here. P3 on Liquid Gold. Sky goes around a pumpy bulge. Here you go up the many overlapping bulges.